National Fatherhood Initiative (NFI) is proud to support the upcoming father-son adventure, After Earth, opening May 31. A crash landing leaves teenager Kitai Raige (Jaden Smith) and his legendary father Cypher (Will Smith) stranded on Earth, 1,000 years after cataclysmic events forced humanity’s escape. With Cypher critically injured, Kitai must embark on a perilous journey to signal for help. Facing uncharted terrain, evolved animal species that now rule the planet, and an unstoppable alien creature that escaped during the crash, father and son must learn to work together and trust one another if they want any chance of returning home. Although the film is set in a future world filled with evolved creatures and alien enemies, at its core is the relationship between a father and son whose bond has been strained by past trauma. The film is set at that inevitable time when a father has to let his child go, and watch them live out the lessons they’ve been taught. Fathers will leave the theater with a better understanding of the pressures of being a son, and sons will empathize with just how trying it can be for a parent to watch their child come of age. 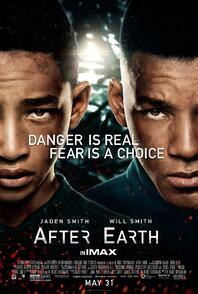 Stay tuned to our After Earth page for more details on the upcoming film.